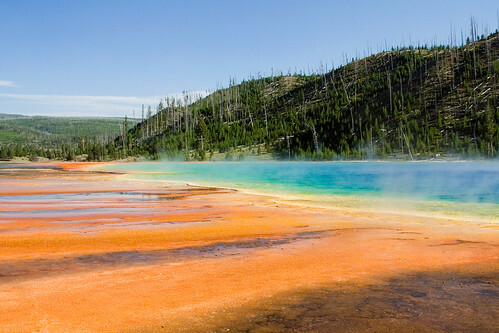 The vivid colors of Grand Prismatic Spring, third largest hot spring in the world, are the result of bacteria in the water. The various colors change according to the season: in the summer oranges and reds are present, and during the winter a dark green color usually abounds. The center of the pool has a deep blue color as a result of the high temperature and depth of the water. This entry was posted on May 21, 2008 at 1:02 pm and filed under bacteria, colorful, Grand Prismatic Spring, hot spring, Midway Geyser Basin, National Park, steam, thermal, vacation, Wyoming, Yellowstone, Yellowstone National Park.